Here's another type of ghost in the scanning machine, presented in honor of Gordon Meyer. 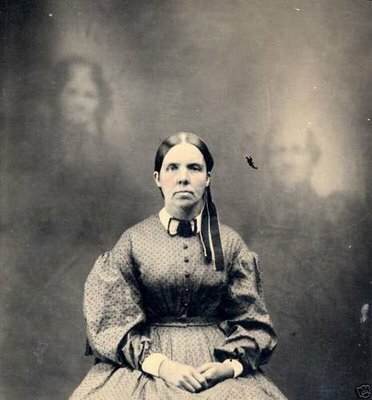 This image recalls the double-exposure spirit photography of the 19th century. 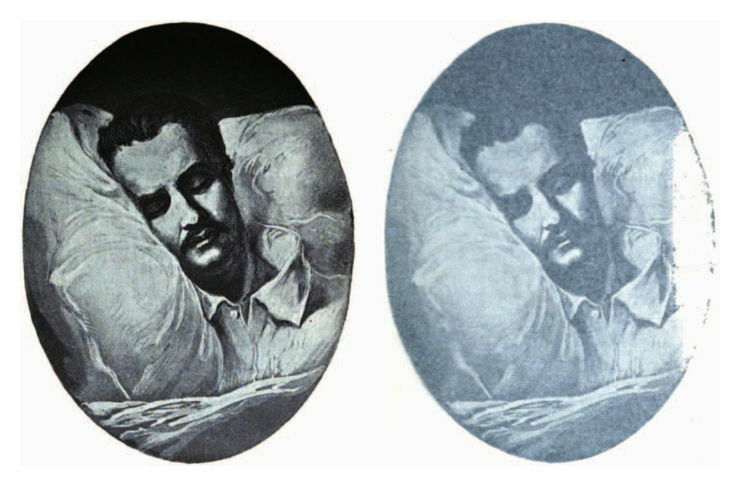 This particular ghost materialized in the Google Books scan of Wilfred Montressor: or, The Secret Order of the Seven: A Romance of Life in the New York Metropolis (1865). We're especially tickled by the ghost of the huge letter Y. To better understand what's going on here, see The Ghost in the [Scanning] Machine. "This may come as a surprise, but the greatest challenge in life is not failure; it is success." 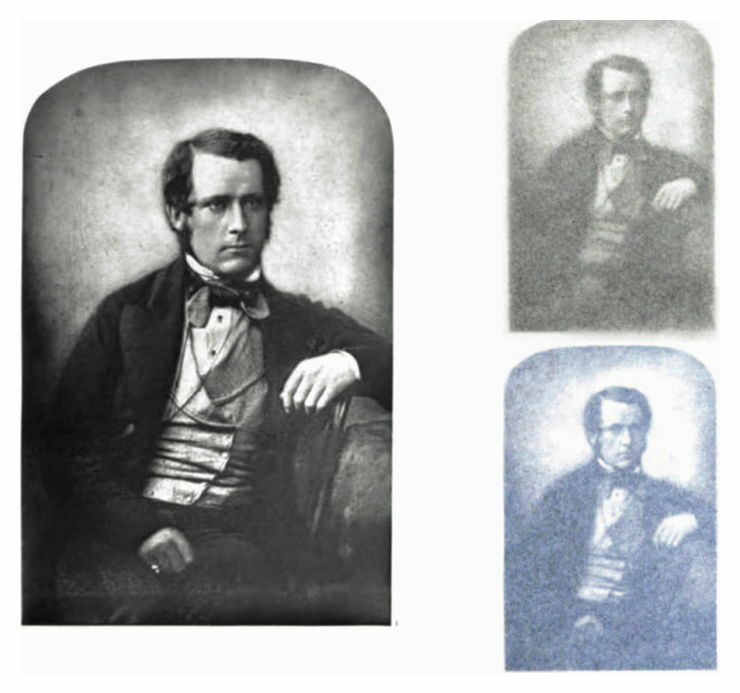 Portrait from Memoir of George Edmund Street. In this haunting, the ghost appears twice, once in a gray shadow and once in a blue mist. "Don't take this the wrong way or try to read into it, but I wouldn't waste your time trying to figure me out." This isn't encouraging me in my writing of your unauthorized biography. "All writing is extemporaneous because it is always bound by the temporal sphere." "The surprising truth is, heavy creams don't always moisturize well enough to help dry skin recuperate overnight." "When the majority is buying, you should consider selling." I dreamed that a misplaced question mark obfuscated the entire meaning of Shakespeare's Hamlet. To be or not to be: that is the question? "Most of what matters in our lives takes place in our absence." Portrait from Memoir of the Life of John Quincy Adams. "This may come as a surprise, but 'faking it' is an honored tradition among piano and keyboard players." For you, gentle reader: two lost pages from our book on Divination by Punctuation. "How delightful it would be to find a few people, or even one person, unconditionally thrilled by what one had to say." Ce n'est pas une page blanche. Ironically, this not-quite blank page appears in a book on Buddhist philosophy. Ironic is it not? I suppose it all depends from which way you look at it. From the Buddhist "less is more" perspective, the page should have been left truly blank, without the message stating the obvious and in the process marring the original blankness. I disagree Prof. Oddfellow. Only those in the industry would understand the intent of such a page. As more and more books are sold to the public such devices are appropriate and required. Off topic. I do hope local bookstores sort the sales war with the Internet shops. They may be in for a rather humiliating revenue quarter but then again they if they are in the book selling business; expect competition from all directions. Brilliant twist on René Magritte's "The Treachery of Images", Prof. Oddfellow! Re. "less is more": Perhaps the idea was that making the blank page slightly less blank in effect makes it blanker? This is clearly a reference to the STRANGERS WITH CANDY episode, "The Blank Page," in which Jerri learns that reading and writing can be dangerous. "This may come as a surprise, but most colleges actually expect you to spend some time learning." 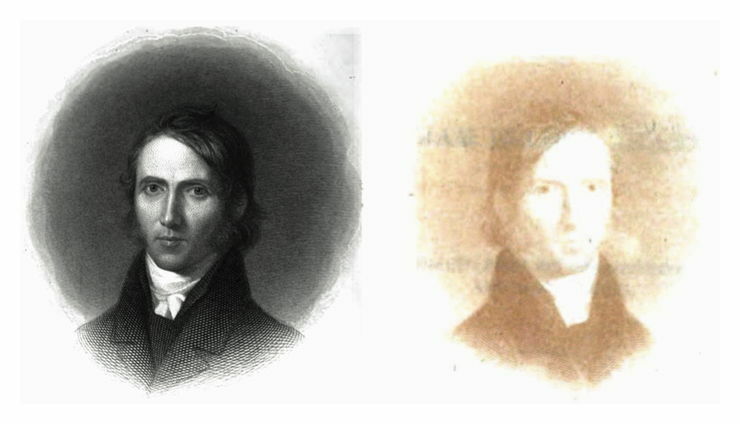 Portrait from Memoir of William Ellery Channing. This intriguing ghost portrait both mirrors and brings color to the halo of the original. "The surprising truth is that few people actually know exactly where the world's forests, grasslands, deserts, mountains, alluvial soils, or mineral resources are located." Is our One-Letter Words: A Dictionary a sham? Australian secondhand book dealers Huc & Gabet discovered our tome amid Latin and Yiddish dictionaries (we approve), then asked a bookseller and a scientist (who had never seen our book) if such a dictionary must be a sham. Here's the full report. But seriously, we're glad all the recent natural disasters in Australia haven't distracted from the really important issues. As I understand the argument in this review, a key premise is that a "proper" dictionary must contain the definitions for any word entry on a single page (or perhaps some number of pages fewer than eight -- as Huc & Gabet phrased their objection to One-Letter Words: A Dictionary, "to get a meaning you need to read 8 pages of text"). If one searches for the word "set" on dictionary.com, one finds that the word has over 100 definitions. So by extension, H&G would be forced to admit that either (1) dictionary.com is not a dictionary, or (2) the word "set" is not a word. I'm frankly dumbfounded by the logic in this review. I am feeling completely shammed by the illustrated dictionary on my shelf. Where could something like this lead? 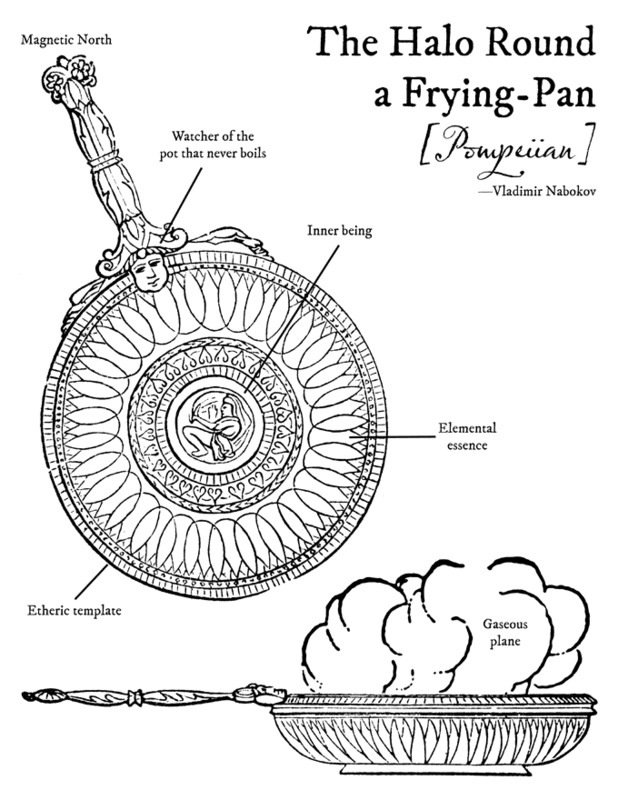 On some pages there are only three illustrations, and no definitions at all, merely labels. I doubt its very existence. dic·tion·ar·y [dik-shuh-ner-ee] –noun, plural -ar·ies. 1. a book containing a selection of the words of a language, usually arranged alphabetically, giving information about their meanings, pronunciations, etymologies, inflected forms, etc., expressed in either the same or another language; lexicon; glossary: a dictionary of English; a Japanese-English dictionary, one letter words. And some people observe and comment upon what others do. Each of us does what he can do. I have unraveled the mystery. I believe this "Robin" is, in fact, a precocious two-month-old who recently became aware of his fingers, and is now happily engaged in "reviewing" every book on his father's shelf. Strangely, he is able to construct quasi-coherent sentences, but hasn't yet acquired the ability to read. His mother is a "scientist." Prof. Oddfellow asks a potentially trick question: can you find the sham? He holds a copy of his dictionary of one-letter words and Robert E. Neale's This is Not a Book. "Whenever someone who knows you disappears, you lose one version of yourself. Yourself as you were seen, as you were judged to be. Lover or enemy, mother or friend, those who know us construct us, and their several knowings slant the different facets of our characters like diamond-cutter's tools. Each such loss is a step leading to the grave, where all versions blend and end." Portrait from Biography of Ephraim McDowell. "The surprising truth is that most scientists apparently are ignorant about the real nature of science." Here's a game of "What am I?" I am an arrogant slap in the face from across the room. I am an ethereal corset trapping everyone in the same unnatural shape. I am a lazy and inelegant concession to fashionable ego. I am too often a substitute for true allure and style. I am an opaque shell concealing everything—revealing nothing. I am a childish masque hiding the timid and unimaginative. These clues are courtesy of Christopher Brosius. Here's a detail of St. Eugene, Patron of Normal Cell Division. See the complete image here. I dreamed of a self-possessed apostrophe—a ghost haunting itself. "This may come as a surprise, but opening lines exist in the animal kingdom as well." Portrait from A Memoir of Honoré de Balzac. "The surprising truth is that the early days of the digital age will appear almost pre-literate to future historians." "Everything occurs immediately even if it takes a while to happen." "With all the mad things destiny leaves lying around, it's a surprise your head doesn't sometimes explode, or something like that!" Avoid ampersands and thorns, suggests The American Archivist (Vol. 28, 1965, p. 363). Geof, you have indeed developed my interest in archivia. (I'd ask you if that was a word, but I can already guess your answer.) By the way, with fresh eyes I see that I should have done a "flip horizontal" on the thorn. Portrait from Autobiography of Amos Kendall. Kendall’s striped aura is courtesy of Google’s scanning machine. "Believe it or not, there are people—important people all over the world—who consider me more than a little competent." "As unlikely as it sounds, there is some version of etiquette for virtually any scenario." I know I am trying to stop texting to the person to whom I am speaking before our conversation ends. Portrait from The Collected Works of William Hazlitt: Fugitive Writings. Can you guess the second half of this headline from LIFE magazine (Sept. 26, 1969)? "Believe it or not, I was turned down for both personal, small business, and women-oriented bank loans." The "why's" of his behaviour were as many X's. Which is funnier: January or August? Clue: This is according to humorist David Sedaris. Portrait from The Life of Edwin Forrest. Inspired by our friend at everybody's favorite Futility Closet. "The surprising truth is that only about one country resident in twelve actually lives on a farm."